Traveling south from Ecuador, I took a couple of buses for some long travel (14 hour-ish) into Peru. The border between Ecuador and Peru is full of Venezuelan refugees sleeping and waiting to be let in. UNHCR has water and medical stations set up to help, but I’ve never seen a border crossing like it in my entire life. The economic meltdown has led to millions of Venezuelans leaving their country and flooding into neighboring regions. Read more about it in this BBC article. 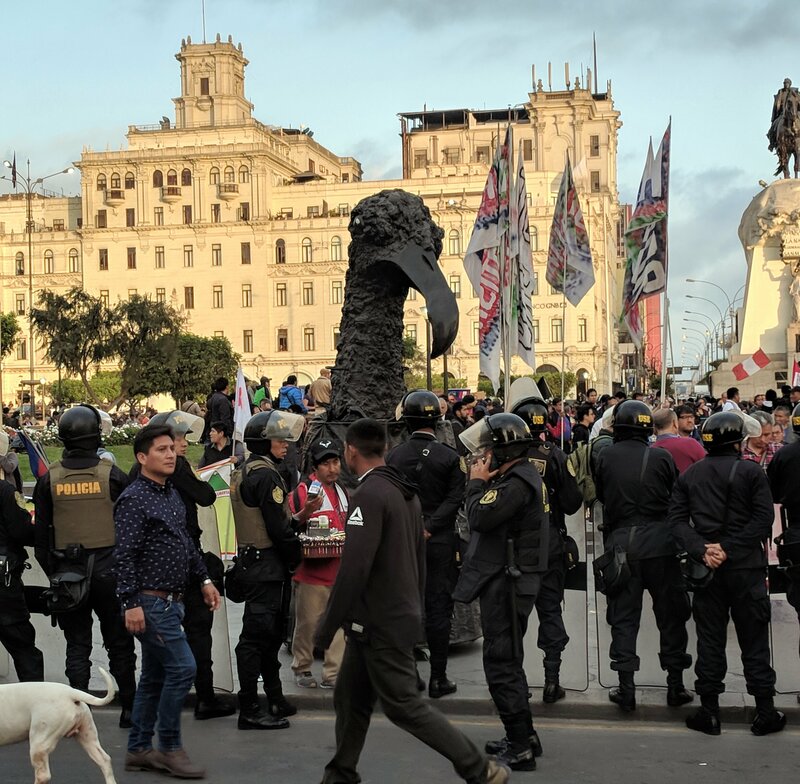 Although many Latin American countries have been very receptive, the flow of refugees hasn’t ceased, which is leading to backlogs and countries starting to close their borders and the situation I witnessed. Trujillo is known for having some of the most amazing Pre-Columbian ruins in South America, which seemed like a great reason to stop. I set out on a daylong tour to explore and our first stops were to see building constructed by the Chimú empire around 1300 AD. They are called huacas, which translates to tombs, but seemed to be used more for ritual sacrifice and other religious purposes. Their empire used to span a huge part of present-day Trujillo right up to the ocean. Although the area is quite arid now, presumably back in the day it was more lush because sea otters and squirrels are found engraved in the walls. The next stop was Hacienda Chan Chan, a sprawling structure in which some parts have been extensively rebuilt. Before these buildings were found, they were protected by the sand and mud that had accumulated around them. Being exposed to the weather has worn down many of the engravings and there is much work that has been done to try and protect what is currently open to the air. Next up was La Huaca de la Luna, and a trip back even further in time to learn about the Moche. This sight has one of the most extensive museums I’ve seen so far with elaborate explanations of cultural rituals. This place was built over many centuries, ending around 600 AD. 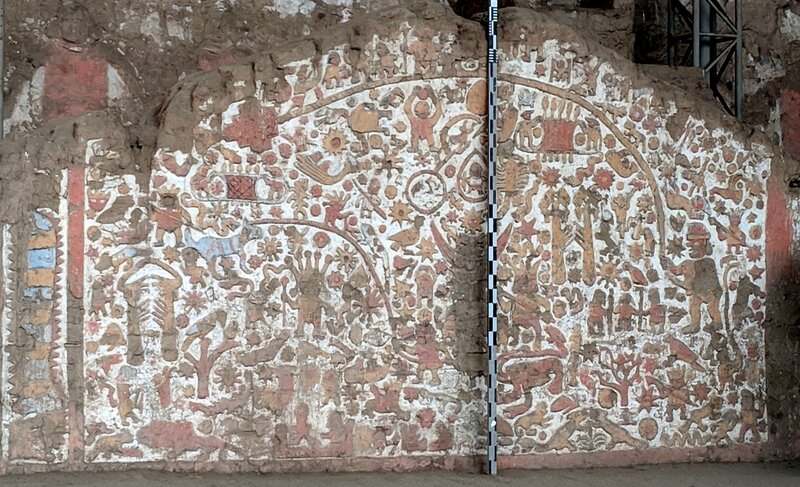 Many ceramics and carved wall paintings have survived and so much more is known about these people, including their practice of ritual sacrifice and that those practices changed based on whether or not they were experiencing an El Niño. Just to emphasize, the Moche knew about El Niño over 1500 years ago. I had a 12 hour stopover in Lima and I really did see many things: catacombs under the Monastery of San Francisco, the coffin containing the bones of conquistador Francisco Pizarro (a.k.a. the murderer of the Incan emperor Atahualpa) inside the Cathedral, and an incredible art museum (I’m in love with the Peruvian graphic designer Elena Izcue who took her inspiration from Nazca pottery). However, perhaps because I was still sleepy or because photos weren’t allowed in some of these spots, I have no photos to share except for a protest I passed which I believe had something to do with the Fujimoris (the former president’s daughter had recently been arrested for money laundering). Nevertheless, I thought the imagery of this bird overlooking the police officers was both creative and symbolic.